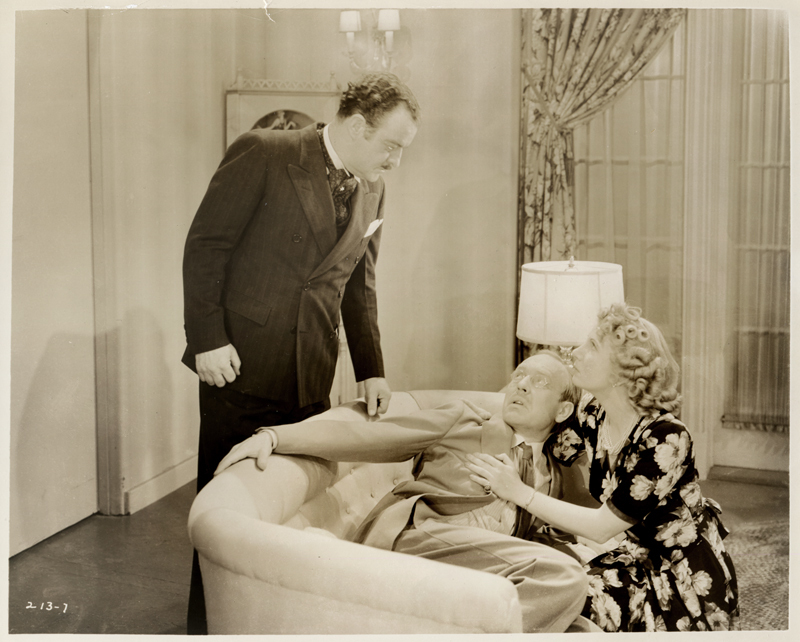 Actor Thornton Edwards (standing) — real-life hero of the 1928 St. Francis Dam Disaster — plays the Italian heavy Enrico Lombardi in the 1942 crime drama "The Panther's Claw" from Motion Picture Associates, distributed by Producers Releasing Corp. This one of several films where Edwards was credited as Joaquin Edwards, his accented alter ego. Released May 15, 1942, the picture is based on detective writer Fulton Oursler's characters Thatcher Colt and Anthony Abbot, and stars Sidney Blackmer, Rick Vallin, Byron Foulger, Herbert Rawlinson and Lynn Starr. LW2406: 9600 dpi jpeg from production still purchased 2013 by Leon Worden from a dealer in Gouda, The Netherlands.